Bishop of Surat Thani Diocese, Joseph Pratan, Thursday, blessed the Marist Centre. in Ranong, Thailand. 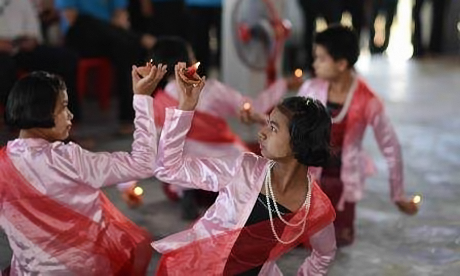 The ceremony was marked by the singing and dancing of Marist Mission Ranong students. A visiting Marist from Ireland, Fr Jimmy McElroy described the occasion as “alive”. Fr McElroy is in Ranong with and students from St Mary’s College in Dundalk. The focus-outreach of the Marist Centre Ranong is on the poorest children in Ranong, Thailand, offering them an education and hope the future. The new centre combines all the programmes, which were formerly in three separate rented sites, into one purpose-built complex. The Ceremony was also attended by two bishops from Myanmar, Fr Pat Devlin, the New Zealand Marist Superior of Marist Philippines District, Fr Kevin Stewart, and Mr Geoff Henry, from the Marist Mission Centre Australia, another New Zealand Marist, Fr Frank Bird, who came down from Bangkok where he is studying the Thai language, three Thai priests and 3 Burmese priests, the catholic community in Ranong, friends from Singapore, and the Marist Brothers (FMS) from Bangkok. The centre was officially opened in a ceremony on May 21, attended by Thai government authorities headed by Mr Pritcha Buaking, the Director of the Ministry of Eduction, Ranong.